Join me in reminiscing about the first Hunger Games movie and the Hidden Job Market. The scene where all but two of the Tributes–one being Katniss– rush to the weapons is analogous to how the smartest jobseekers go where the majority of the jobs are, unadvertised. Almost two years ago I saw The Hunger Games with my daughter and one of her friends. When we got into a discussion about the various scenes in the movie, we all agreed that Rue’s death was the saddest. There’s another scene I would classify as more bloody and kick-you-in-the-gut than sad. It’s when the tributes race from their platforms and charge to the Cornucopia to get the weapons of their choice. Wham, like 12 kids get wiped out. It’s at this point when I thought this is not an appropriate movie for two 14-year-olds or, for that matter, me. It began to look like a scene out of Platoon or the Deer Hunter on steroids. Prior to this scene, Haymitch tells Katniss to head for the high grounds, not the weapons. “Water will be your best friend,” he advises. The things-career-related freak I am, I immediately saw a parallel to the career search and this scene. Obviously the higher grounds, where the water is, represents networking one’s way to the Hidden Job Market, where 80% of the jobs exist unbeknownst to many jobseekers. It appears only two people in the movie make this wise move, Katniss and Peeta, while the others go for the desirable weapons and other goods. The Cornucopia and the weapons, on the other hand, signify the advertised jobs, representing 20% of the available jobs. The tributes who race all at once for the weapons are the majority of jobseekers vying for the measly number of available jobs. Don’t you see it? You may think it’s silly to equate a scene in a teenage movie to the job search and, further, you may think me a lunatic. But you don’t know me; I’m always thinking about how the job search relates to…almost anything. In this case, it’s about taking control you your job search. Shuck off the job boards (the Cornucopia), The Hunger Games tells us, and unlock the HJM. 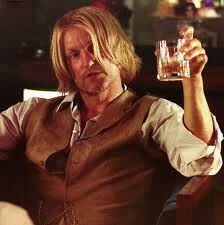 Haymitch’s advice was wise and followed by Katniss, thus saving her life. Certainly the makers of The Hunger Games didn’t devise that scene with the job search in mind. It was merely to point out the best and worst way to survive in a battle to the death, albeit a bit extreme to compare it to the job search, that’s the way I see it. Are you as obsessed with the job search as I am? Probably not. This entry was posted in Career Search and tagged 20%, 80%, HJM, The Hunger Games on November 30, 2013 by Things Career Related. Bob- After listening to the feedback from more than 1,000 Boomer workers, they seem to be frustrated by the concept of the hidden job market – the other 80%. They wonder why, if so many people are aware of it (me included), why do workers still join the mobs who are focusing on the 20% that are advertised/posted? It’s a lot easier to upload a resume to Monster, Dice, CareerBuilder, etc., than it is to network. The job boards and, before them, the newspapers brought out the laziness in us. Bob- Why would people prefer easy to results? I love the Hunger Games analogy. Honestly, in my line of work, we rely heavily on networks to find the best teachers. In a highly competitive market (teaching in Westchester) we get hundreds of online applications. The filters are never as user friendly as they should be and often don’t reveal a true picture of the candidates. A phone call from an administrator or teacher in a respected nearby district goes a long way in securing an interview. Well done. Sometimes the job search does feel like “survival of the fittest”. In this case, it’s also survival of the wisest…the one who chooses to go another direction.